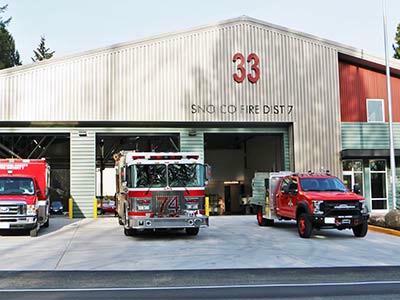 [Monroe, WA] – Fire Station 33, 19424 Fales Road, has officially opened to service the citizens of Fire District 7. The new fire station is located near the intersection of Fales Road and highway 522. The 11,000 square foot fire station will provide improved response times and accessibility to the Echo Lake and Lost Lake communities while continuing to meet the District response standards for the Maltby/Paradise Lake Road communities. The new station features three apparatus bays, office and training areas, and dorms for the crew. The crew that was assigned to Station 74, Maltby Station, have been reassigned to the new facility and on Monday morning drove the apparatus over to the new station. Department personnel held a short flag raising ceremony and pushed the apparatus into the bay for the first time. Personnel assigned to Fire Station 74 will now staff the new fire station and the old facility will be utilized for additional needs of the district. Fire District 7 will hold a formal public ribbon cutting and open house to celebrate the opening of the new fire station on Monday, May 6th at 6:00 pm.